In a few short months, both you and your family will be able to soak up a beautiful day of sailing around Annapolis, MD aboard The Liberté. In a few short months, both you and your family will be able to soak up a beautiful day of sailing around Annapolis, MD aboard The Liberté. Not only is Annapolis full of beautiful spring and summer scenery, but it is also full of memorable landmarks as the capital of Maryland! As you enjoy a fun and exciting daysail with family and friends, consider these three memorable landmarks to have your camera ready for this summer! Enjoy the sights of the United States Naval Academy as you sail along Annapolis this year. 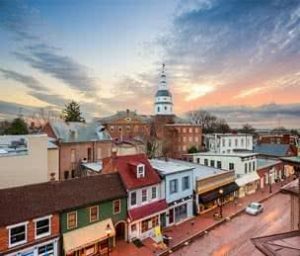 No matter when you choose to schedule your sail, you are sure to have plenty of beautiful photo opportunities with this recognizable Annapolis landmark. Soak up this excellent view of the Naval Academy from the Severn River, and catch an especially scenic view a unique perspective. The colorful buildings and historic streets of downtown Annapolis make the view especially photogenic from the water. Enjoy taking photos of Maryland’s beautiful capital city and its many bright colors as you sail alongside the cobblestone streets and docks. Not only are these brightly colored buildings a perfect photo opportunity, but you will also be able to catch some great shots of docked boats as well. While you and your family have driven over this beautiful Maryland landmark on your way to the beach, have you ever enjoyed a view of the Chesapeake Bay Bridge from the water? Take in a gorgeous look of the bridge beyond your summer vacation commute to the ocean. As you are sailing alongside the bridge, you can snap a series of frame-worthy photos of this special Maryland landmark. Plan your Day in Annapolis with a Sail Aboard The Liberté! This entry was posted on Friday, February 8th, 2019 at 12:11 pm. Both comments and pings are currently closed.